These plastic Halloween skulls filled with powdered sugar. Each skull is filled with fruit flavored sugar. 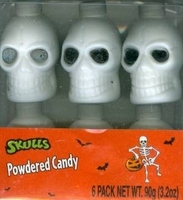 Kids love pixy stick and fun dip, these skulls would be a perfect Halloween candy. If you are looking for Halloween candy for party favors or to hand out to your spooky guests these would be perfect. Each skull is approx. 1 3/4" of pure sugary fun.